First make a lemon curd using the juice, and rind of 3 big lemons ( I added a little extra juice, ) 8 egg yolks and a cup of sugar. I cooked this over a double boiler for about half an hour. ( You don't have to stand there stirring for half an hour. Turn the heat low and stir it up every five minutes. ) When cool I whipped a pint of heavy cream mixed with a 1/2 cup of 10x sugar and folded it into the curd. I made lady fingers and lined the molds I was using with them. 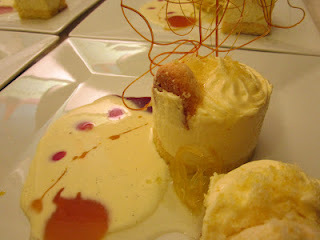 I soaked the ladyfingers with lemon syrup and piped the cream into the molds. I put them in the freezer as this is a 'semi-fredo,' or partly frozen dessert. As the growing season draws to a close, and the atmosphere is no longer warm enough to ripen the many tomatoes still on the vine, green tomatoes are one of the last products our gardens have to give. What can be done with them? They can be fried or battered sweet or savory, but I tire of them quickly. I have also made green tomato ice cream. It may sound bizarre, but it is great, and unlike anything anyone who has tried it has ever tasted. Pickles, and green tomato pie are my favorites. I had one habenero plant which burst into intense production at the end of September, and by last week had produced more than forty multicolored peppers which hung in clusters like Japanese lanterns. I decided to pickle them along with the green tomatoes. I chose the simplest method. 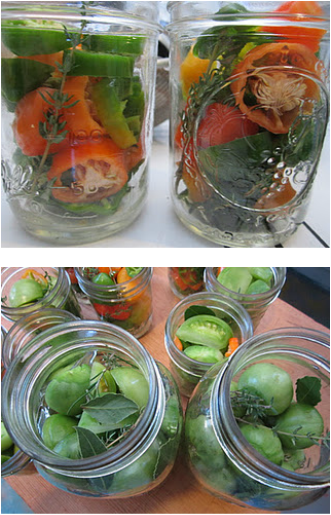 I sterilized the bottles, and then packed them with herbs and alternately, the tomatoes or habeneros. I salted the tomatoes which I had sliced into wedges, and let them weep their water out for a few hours. I dried them and put them in the jars. I had enough babies for only one jar, and these I put in whole with just the stem removed. I put one slice of habenero into each jar of tomatoes. I cut the tops off of the peppers. Some I sliced, some I used whole. I made a brine and poured it just boiling into the jars and sealed them. I will give the recipe tomorrow. Many times when doing a project, there are only a few pictures good enough to use. This time, the opposite was true and I spent over an hour picking out the ones you see here. Maybe it was my new 500 watt, sunlight counteracting photography bulb. I make the green tomato pie almost exactly like making an apple pie, and they are wonderful. I put sugar on the tomatoes and let them weep their liquid, then I squeeze out most of the liquid. I then put more sugar and corn starch, and just the barest hint of cinnamon. Most of the time I resist the temptation to add brown sugar, more cinnamon or other spices, raisins etc. The taste of the green tomatoes is unique, and oddly compelling, and seems to resist complication. Like apple pie, the tomatoes can be sauteed first, but a true, classic American apple pie starts with raw fruit - and that is how I like my green tomato pie. 1- Keep the dough as wet as possible, while still being able to handle it. 2- Don't stint on the kneading. 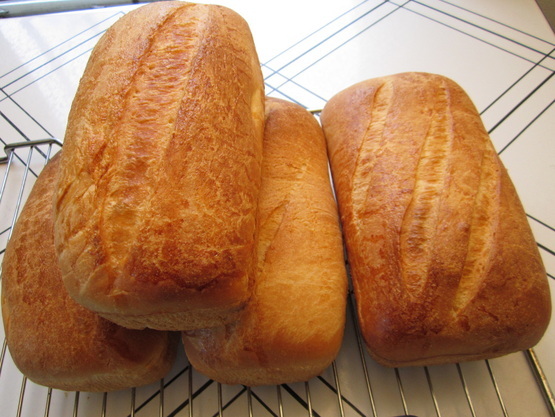 3- Use a thermometer to check the internal temperature of the bread at the end before taking it out of the oven. If it is 190-200 degrees F, it is done! Experience and practice are the best teachers, even when you have a guide ( a teacher or a recipe ). I am making stollen, traditional Christmas sweet bread made in Teutonic countries like Germany and Sweden, and American style raisin bread. The softest most luxurious pastry style breads benefit from using the least amount of flour which can be added to the liquid, and still be handled. Always withhold some of the flour while mixing, slowly adding flour until the dough just begins to come together and clear the bowl. The dough should still be slightly sticky. Place the dough on a generous amount of flour on the work surface and begin to knead. The temperature and humidity in the room, plus the amount of flour already in the dough will determine how much flour the dough will accept. As the dough sticks, just clear the surface with a scraper, sprinkle with flour, and continue kneading. The dough should remain supple but not wet. Resist the temptation to make the dough look "perfect," in other words perfectly smooth. it should be as moist and sticky as possible, while still allowing you to be able to work with it. During the first rise, the dough will absorb the moisture ( on the cellular, microscopic level ) which no amount of kneading is able to force into the dough. The dough should almost triple in bulk, and a finger poked into the dough should produce a dent which does not spring back. When kneading by hand, allow 10-15 minutes of kneading. Diligence at this step will reward you with fine results. (and it is good exercise ) Most household mixers are not designed for dough kneading. They come with a dough hook, but this is for mixing, which is an extremely messy job if done by hand in a bowl or on tabletop. The kneading of soft yeast dough’s and certainly true breads will stress and even burn out your mixer, and kneading by hand conveys an encyclopedia of sensual information. It is an education in and of itself. The baking time given in a recipe is only an approximation. Again, the conditions which prevail in your kitchen and oven are the gospel which must be attended. Most every oven has its quirks, strengths and faults. 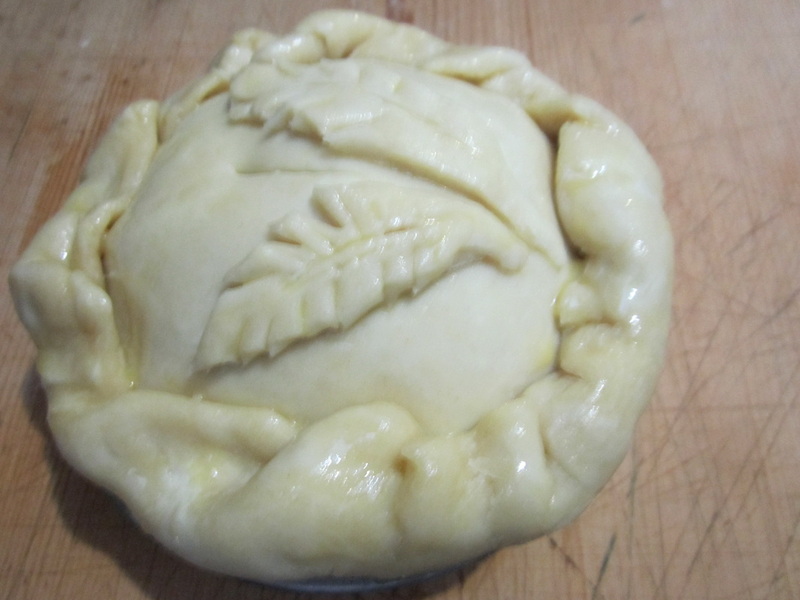 The dent which shows it has risen sufficiently, and is ready to punch down for the second rise. All instructions for making cheese cake say to bake the cake until the top is no longer jiggly. That is the mistake, right there. 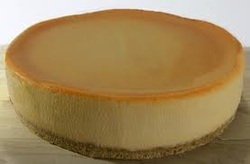 Cheese cake, like it's cousins: pumpkin pie, coconut custard pie, key lime pie, quiches etc., is a custard. That means a liquid combined with eggs which is then baked. The proteins in eggs set at about 160 degrees Fahrenheit. With the addition of sugar and liquids, ( water, milk, cream, ) the temperature at which the custard will set is 175- 180. This is the reason for cooking the cheesecake inside a pan of water. Water cannot get higher than 212 degrees F except under pressure, ( or when it becomes a vapor ). The "water-bath" as this method is called, makes sure the cheesecake is protected from the 325-375 degree F temperatures which most cheese cake recipes call for. This method assures, provided you take it out of the oven soon enough, that the cheesecake will get to the temperature required to set the proteins in the eggs slowly. Why do this? For the same reason that a car going at 100 miles an hour cannot stop as quickly as one which is going 30 mph. If the custard is brought to 180 degrees F in a 350 degree F oven without the water protecting it, the custard is well on its way to being way over 200 degrees by the time it cools down. (curdled and over-cooked. It cannot "stop on a dime," as it were. This is why people over cook meats. If the meat is rare ( 120 degrees F ) when it comes off the fire, it will be 130-135 degrees F when it cools down. In other words, medium rare. So, I took my cheesecake out while it was a bit jiggly, and tooth pick inserted did not come out dry, it was coated with cheesecake batter. 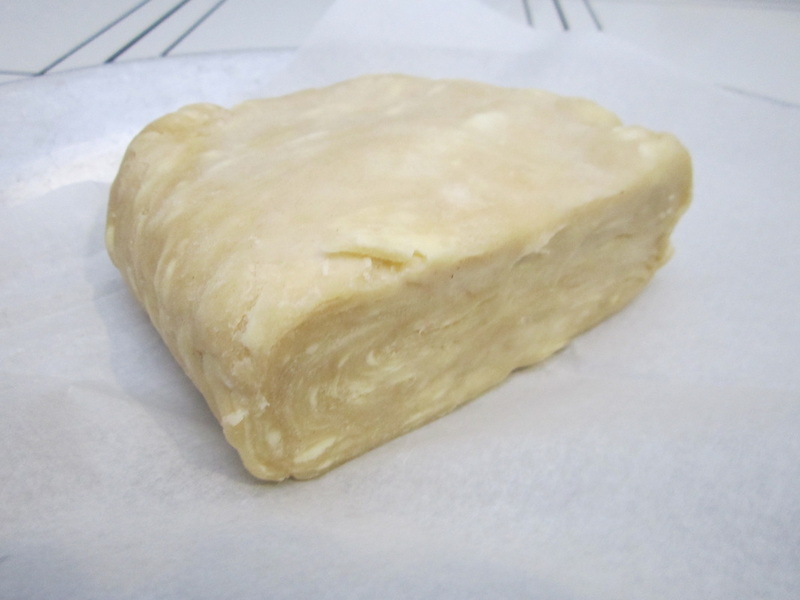 If you do this, you must leave it overnight until you can unmold it and cut it. It is cream cheese, and it will almost set without cooking it. simply add cream to any cheese cake recipe, until it looks like very thick pan cake batter, and take it out of the oven while it is still "jiggly," like I did, and you will never go back to the old way of doing it.